“Songs of the Civil Rights Movement”: Actor Clarke Peters narrates a special edition of Soul Music marking fifty years since the assassination of the Reverend Dr Martin Luther King on April 4th 1968. “If in doubt, pray and sing” an activist recalls how music was used as part of Dr King’s non-violent resistance movement. This edition of Soul Music tells the stories of the songs behind the Civil Rights Movement including the spirituals and freedom songs that were integral to the struggle. In the 19th century, music became a tool for protest and resistance among the enslaved peoples of the American South. The programme hears the stories behind some of the most popular anthems and Freedom Songs that were later used as part of the civil resistance movement that eventually led to voting rights and desegregation. From Swing Low Sweet Chariot and We Shall Overcome to Amazing Grace, Strange Fruit and A Change Is Gonna Come, witnesses to and participants in the Civil Rights Movement recall how songs were such a vital part of the story. “A Change Is Gonna Come, by Sam Cooke”: Soul Music explores a song that has become synonymous with the American Civil Rights Movement, Sam Cooke’s A Change Is Gonna Come released in December 1964 two weeks after he was shot dead in Los Angeles. Contributors include Sam Cooke’s brother LC, singer Bettye Lavette who sang it for Barack Obama at his inaugural ceremony and civil rights activists from the Freedom Summer of 64, Jennifer Lawson and Mary King. “Civil Resistance: The Power of the People”: A 51-minute radio documentary that has been airing on the show America Abroad on National Public Radio stations around the United States since May. Mary is the third person to speak. Mary King delivered this lecture, “Behind the Arab Awakening: Dynamics of Civil Resistance”, on Monday, January 23, 2012 at Green Templeton College, Oxford in conjunction the Centre for International Studies at Oxford. Mary is a Rothermere American Institute Fellow at the University of Oxford. Andrew Marr discusses “revolution” with the Egyptian writer and blogger, Wael Ghonim; Paul Mason, economics journalist and author; and Mary King, Professor of Peace and Conflict Studies at the University for Peace (an affiliate of the UN)and Rothermere American Institute Fellow at the University of Oxford. The Tavis Smiley Show aired a panel discussion Where Do We Go From Here? on Public Radio International on Friday, July 23, 2010. Click the play button above to listen to a brief excerpt, Mary’s remarks, from the discussion moderated by Tavis Smiley, which featured Clayborne Carson, Dorothy Cotton, Vincent Harding, Mary King, Eric Mann, Michael Nagler, and Kiran Bir Sethi. 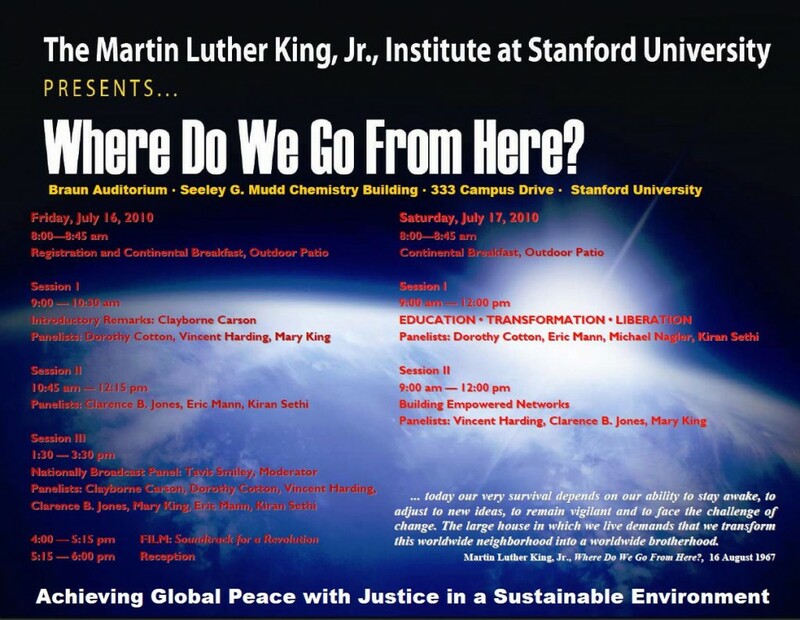 The discussion took place at the Martin Luther King Jr. Research and Education Institute, Stanford University.